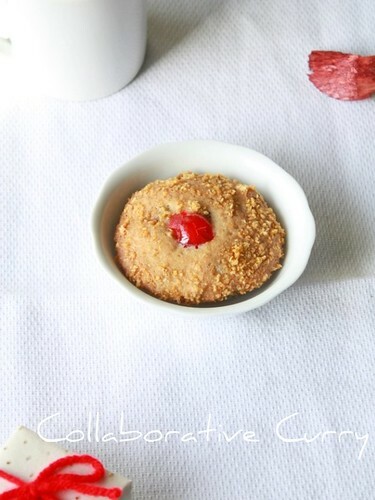 We would like to share some awards and celebrate with a recipe for cherry winks. Please accept the awards and spot them on your sites. We thank you all for stopping by, leaving your comments and sharing your token of appreciations through awards. The recipe for the day, cherry winks were made during Christmas. I am still sticking to my no sweets regimen and please pray with me I keep it that way for a while. Blogging has gotten me into a sweet binge and I am trying to cut down for a while. Coming back to the topic of discussion the recipe is from my friend who instead got it from her mother. These were collected in a cook book, brought out by the ladies of her neighborhood in Kansas City, in the ‘40’s. They are crunchy and very pretty spiffed up with the maraschino cherries. I hope you enjoy this time tested cookies as much as I do. 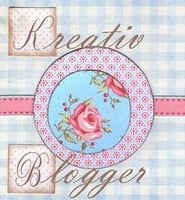 Kreative blogger comes with some rules. Namitha and I have shared it with you before. We request everyone who receives the award to follow the rules. Namitha and I am would like to especially thank you guys who gave us these awards. 1. Have a love-hate relationship with rain. 2. Love Photography as much as I love cooking. 5.A dessert maniac, and love almost anything that is sweet. 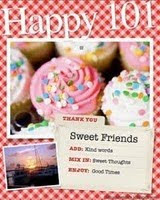 Kitchen queen (Indu) and Soumya has awarded "happy 101"
6. Drop a tablespoon each into corn flakes and roll till the doubh is coated. Notes: The dough is sticky. Rolling in the flakes may seem hard, but if you use the spoon and lightly using your finger tip maneuver, you will be fine. I love photography as much as cooking, too. Never knew I would when I started blogging. Enjoy the awards, very well deserved. Congrats on all your awards. Cookie looks too good. Nice name. Congrats on the awards guys :) Those cherry winks look so adorable! Congratulations on the awards! Love your cherry winks! 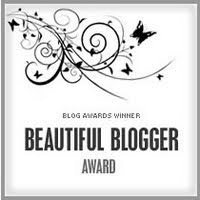 Congratulations ~ all of your awards are well deserved, because you definitely offer some terrific recipes, tips and stories. Never I have stopped by and not found something creatively delicious. Keep 'em coming like these wonderful Cherry Winks. congrats on ur awards and just keep rocking. Heartiest congratulations for your award. Cookies looks fantastic and yummy. Thanks for this new type of recipe. Congrats on shedding light about urself and ofcourse on your awards. Congrats on ur awards, this cherry winks incredible and beautiful..looks very pretty..
Congrats on ur award, may u get more. loved the cherry winks, nice click. 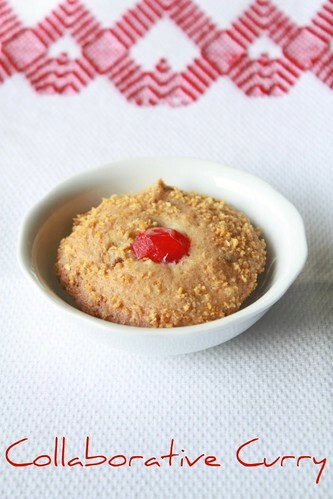 Congrats on ur award,Cherry Winks are gonna be a big hit,looks so delicious..
cherry winks.. loooks lovely!.. nice name for it :).. nice to know things about you :):)... beautifully clicked pics!! Lovely cookie and beautiful embroidery on the table mat. Oh wow!! that looks so cute!!! love the name cherry winks!! Congrats both of you on earning these awards.. very well deserved indeed. Namitha, how do you manage to get thinner when you cook such exception desserts, girl! I envy you now ;) Thanks a lot by the way for the clarification on substituting brown sugar for jaggery. congrats on ur awards.. cherry winks luks delicious..
Congrats on your awards and the cherry winks looks superb. congrats on ur awards and nice to know abt u.
the cherry winks looks so cute. Cookie is cute and new to me. Thanks for the continuous support in my blog for every post. Special thanks to Namitha dear. congraz on all your awards,cookies are really lovely and delicious..
as usual, your cookie look lovely. congrats on all ur awards, dear...perfectly made cookies...love ur clicks so much...so tempting! Cherry winks...lovely name, looks awesome. congratulations to both of you for the awards!! !Enjoy them ladies!!! cornflakes coated cookies look miam miam and crunchy, simply perfect!!! we are sweet maniacs at home too, so, this will disappear in no time!!! I'm going to make some of this for Chinese new year! Hi the name is so catchy and the click so very inviting. Good recipe to try and thanks for all the tips. Congrats on all the awards. cherry winks looks crunchy..love to have that one. Cherry winks look very cute! congrats on all your awards! hey congrats on all your awards !!! these look cute and great pictures !! Cherry winks look so pretty! Congrats on your awards, the cherry wink looks very cute!!! congrats on your awards..love the cherry winks and the snaps..
Congratulations on awards!! this dish is new to me! looks so so delicious! lovely clicks. Congratulations on ur awards, cherry wink looks yummy and pretty. Love the name cherry winks. Beautiful Pic. Congratulations on all the awards! You really deserved them! Aww!!! I love shopping for my kid too and I also have a love-hate relationship with rain!!! Your cookie looks oh so yummy! I loved that you used corn flakes crushed, dates and pecans in the mixture, sounds interesting! Congratulations on the well earned awards! !